Is Groupon's Strategy Off the Mark? Home Ecommerce Platform Is Groupon's Strategy Off the Mark? Is Groupon’s Strategy Off the Mark? I’m sure by now you’ve heard about Groupon’s IPO, which has more than one person singing “here comes another bubble…” Many folks including Forrester’s Sucharita Mulpuru believe the daily deals site is way overvalued, and question whether the business has potential for future growth, or is headed for a burst. Attracting new subscribers is becoming more expensive. Numbers cited by the NY Post suggest it’s getting more expensive for Groupon to attract new subscribers, and customers on average are also generating less revenue year-over-year. Each new subscriber costs $6.40 in marketing expense, compared to $2.45 the same quarter last year. Each customer generated $9.65, down from $17 last year. Ouch. With only 19% of subscribers actually buying a deal, the only hope is squeezing more revenue from subscribers. Many of us can relate, at first the Groupon concept was exciting and we looked forward to daily emails. We were so enamoured we even signed up to the clones. Some of us even purchased a few, on impulse, yet to cash them in. But after a few weeks, the novelty wears off and we ignore them just like all the other commercial email we opted into. OK, I’m speaking from experience, but surveys show I’m not alone. 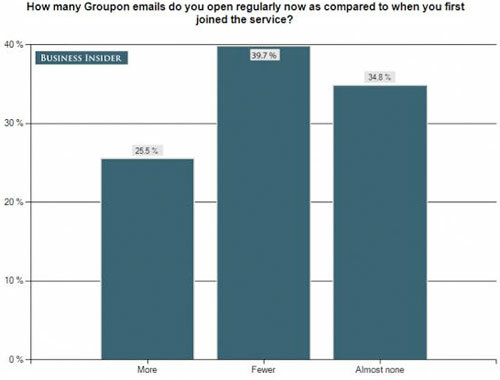 Business Insider polled its own readers found that 35% of Groupies open “almost none” of the daily emails Groupon sends, 40% open fewer and only 25% are opening more often than when they first joined. 69% of Groupon subscribers do not expect to purchase Groupons more frequently in the future. Groupon should be just as concerned, if not more, of keeping subscribers engaged than sniffing out new ones. Aside from publicized Grouponmares, 40% of businesses who have advertised with Groupon would not participate in a deal again. Hey, that still leaves 60% who could potentially advertise again, right? Without a good retention strategy, Groupon will squander these relationships. As word gets out about the poor ROI and other issues and businesses are courted by competitors like Living Social, Facebook and Google Wallet, it will be harder to win new business than quarters past. What do you think about Groupon’s strategy? Should Groupon’s focus be on winning new subscribers and advertisers or will it advertise its way out of business? Would love to hear your thoughts in the comments (linked for email subscribers). Looking for help with A/B and multivariate testing? Contact the Elastic Path consulting team at consulting[at]elasticpath.com to learn how our conversion optimization services can improve your business results. Next articleA/B and Multivariate Test Validity: Beware of Bad Data!